I'm back from vacation in Seattle with a Quick & Easy Ground Lamb With Zucchini & Corn Recipe. My friends from Superior Farms challenged me to create a quick healthy weeknight dinner recipe using ground lamb and provided a stipend for ingredients. Given that the temperatures are rising and the summer produce is starting to show up, I wanted to make a recipe that took minutes to make and featured some of my favorite summer produce: corn and tomatoes! 1. Heat olive oil in a large skillet. Add ground lamb and saute on medium heat for 5 minutes. 2. Pour out most of the fat. 3. Add zucchini and corn, season with salt and pepper, and saute for 15 minutes. 4. 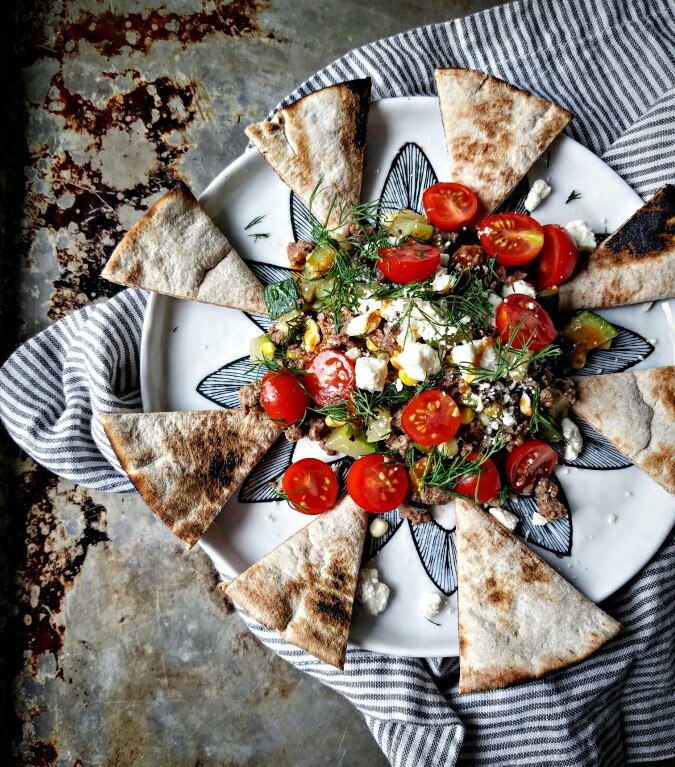 Toast pitas (in the oven or directly on the gas flame or in a cast iron skillet). 5. Serve a quarter of lamb mixture topped with a quarter of feta, tomatoes and dill, drizzled with as much of hot sauce as you like. 6. This can be eaten with the cut up pita OR you can cut the pita in half and make pita pockets. This dish had a lot of flavor but did not feel heavy. You can serve this mixture on a bed of salad greens or on top of cubed and roasted sweet potato or use it to make stuffed peppers.